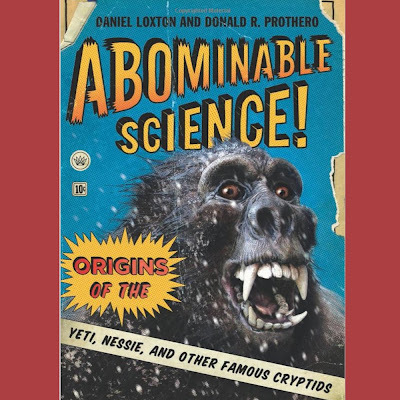 I am grateful for the book and find it sympathetic to cryptozoology. The ideology of Bigfooters is a spectrum that spans from the paranormal to the biological. As someone who falls into the biological camp, I welcome doubt and criticism. When someone disagrees without being disagreeable, it is a favor and a contribution to Bigfoot research. I feel like Daniel Loxton and Donald R. Prothero have done us a favor. It is clear Abominable Science! 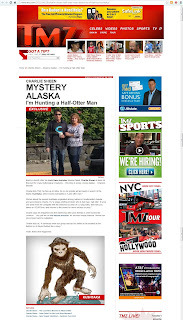 presents many challenges to flagship Bigfoot encounters, but these challenges, in my opinion, are in good faith and worth accepting as challenges. Did William Roe's encounter change the consensus description of Sasquatches from "giant hairy Indians" to a more ape-like creatures? Is the fact that there is no record of any Bigfoot researcher ever meeting William Roe face-to-face significant? 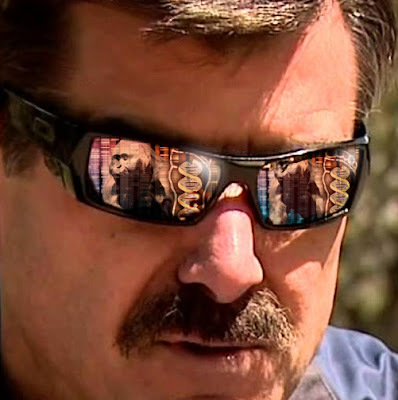 Is the Patterson-Gimlin film really too similar to to the Roe encounter? There are a few points where I believe transitive logic (If A=B and B=C then A must = C) is abused. On page 49, "If Roe's report is a hoax, we would be compelled to conclude that the Patterson-Gimlin film is also a hoax." Compelled to conclude? Compelled to question--maybe. On page 70 Loxton writes, "we must grant that Sasquatches are routinely exposed to the same mortal risks as bears." Why? These statements are backed more by assumption than clear arguments. On the balance I applaud Loxton for casting doubt and challenging the encounters I embrace as definitive Bigfoot canon. Loxton deserves credit for framing and hinging modern bigfoot lore on the Roe encounter, it is a novel context that does not outright dismiss Bigfoot but underscores the value of having a type specimen. As for Prothero? As even Bill Munns agrees the first chapter, Cryptozoology: Real Science or Pseudoscience lays out, "admirably and meticulously what is good science and what is not." For this chapter alone I recommend this book to all bigfooters and aspiring cryptozoologist alike. Also included in the first chapter is a formula used estimate the home range of mammals based on body mass (Ahr=0.024M1.38). It should be noted there are updated more complex formulas that provide more accurate results5, but the point is this is how we should be thinking if we really care about understanding and protecting Bigfoot. Plus, I would have never found the updated model for determining home range if I was not introduced to the concept by Prothero in the first place. I believe we need more animal biologist and statisticians in the field of Bigfoot research. Abominable Science! gives us a taste of what it is like to think like one. 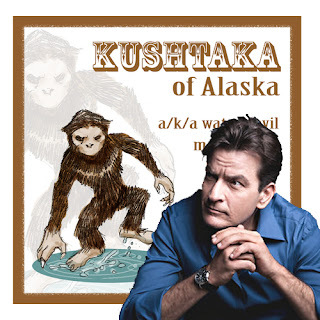 TMZ reports That Chalie Sheen is interested in Cryptids including the Loch Ness Monster and more recently the Kushtaka from Alaska. 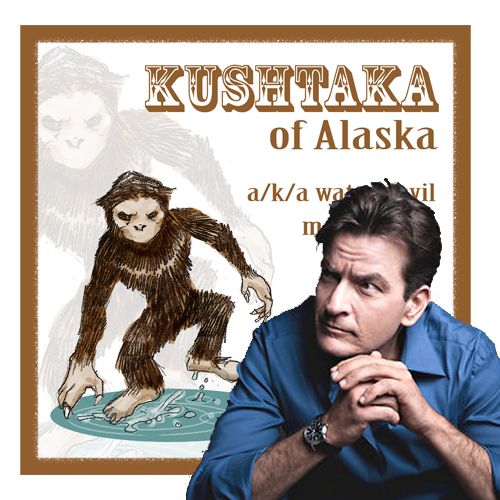 Barely a month after his Loch Ness monster mission failed, Charlie Sheen is back on the hunt for crazy mythological creatures ... this time in snowy, snowy Alaska ... Charlie's favorite. 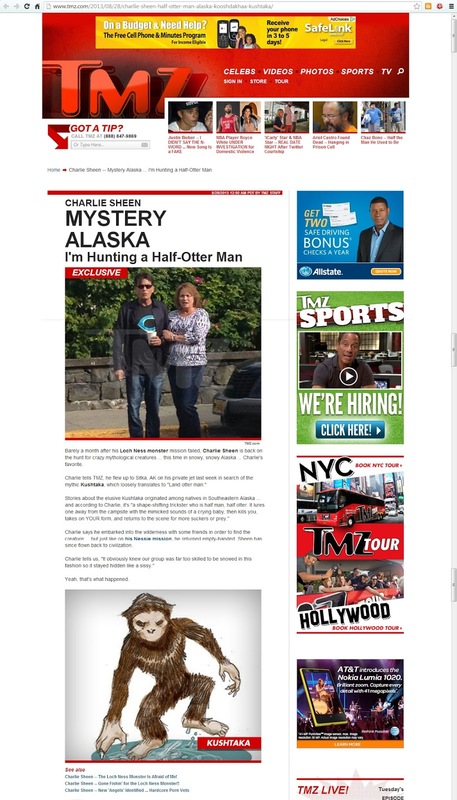 Charlie tells TMZ, he flew up to Sitka, AK on his private jet last week in search of the mythic Kushtaka, which loosely translates to "Land otter man." Stories about the elusive Kushtaka originated among natives in Southeastern Alaska ... and according to Charlie, it's "a shape-shifting trickster who is half man, half otter. It lures one away from the campsite with the mimicked sounds of a crying baby, then kills you, takes on YOUR form, and returns to the scene for more suckers or prey." Charlie says he embarked into the wilderness with some friends in order to find the creature ... but just like on his Nessie mission, he returned empty-handed. Sheen has since flown back to civilization. Charlie tells us, "It obviously knew our group was far too skilled to be snowed in this fashion so it stayed hidden like a sissy."